MIDTOWN, Manhattan (WABC) -- A 20-year-old man arrested in connection with a string of police impersonations has been linked to several hoaxes involving NYPD radios. Authorities say Jay Peralta, of Queens, was found to be responsible for broadcasting the unauthorized transmissions over police radio frequencies that started in April. Along with repeatedly threatening a captain in the Midtown South Precinct, the transmissions included bomb threats involving a pressure cooker, threats to shoot police officers, and false calls of officers in distress. Another suspect, 29-year-old Ricardo Torres, was identified during the investigation as a radio enthusiast who allegedly provided the two-way radios used to make the transmissions. Along with 19-year-old Kevin Remache, the three are believed to be behind at least seven police impersonations in Queens and the Bronx. 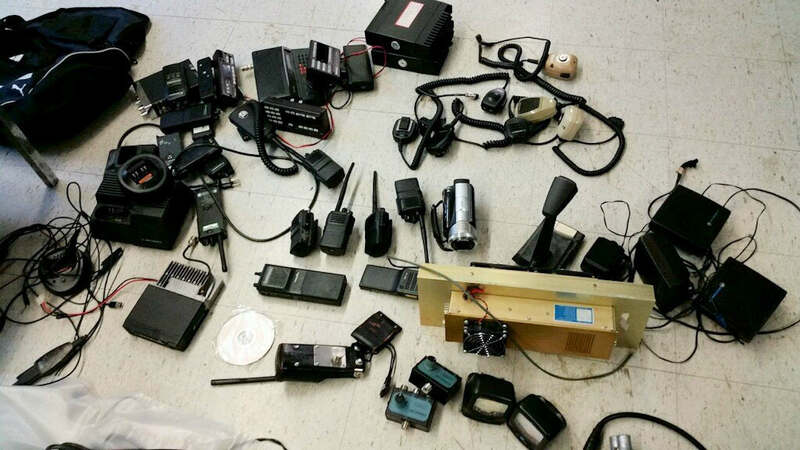 Police say a search warrant executed at Torres' residence yielded 15 portable radios, 9 scanners, 9 hand-held microphones, 4 speakers, 2 roof antennas, 1 amplifier, 4 laptops, 2 desktops computers, 3 cell phones, 7 compact discs, 1 camcorder and 1 note pad.